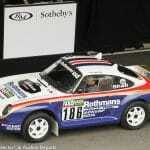 It’s one thing for RM Sotheby’s/Auctions America or Bonhams to pull off two auctions within two weeks. They have staff in abundance. It’s quite something else for Worldwide to do it even moving back into the familiar surroundings of the L-29 Assembly Building at NATMUS in Auburn. But, do it they did, transitioning from the new site at Pacific Grove during Monterey week back to Auburn. 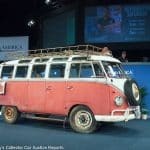 With $2 ¾ million in total sales Worldwide’s 2017 Auburn auction will not go down as a barn-burner … except that in a largely No Reserve sale of several collections it recorded a 96.6% sale rate. There are a few exceptional cars here along with more that were looking for a good, caring home that would appreciate them and give them the attention their inherent qualities deserved. 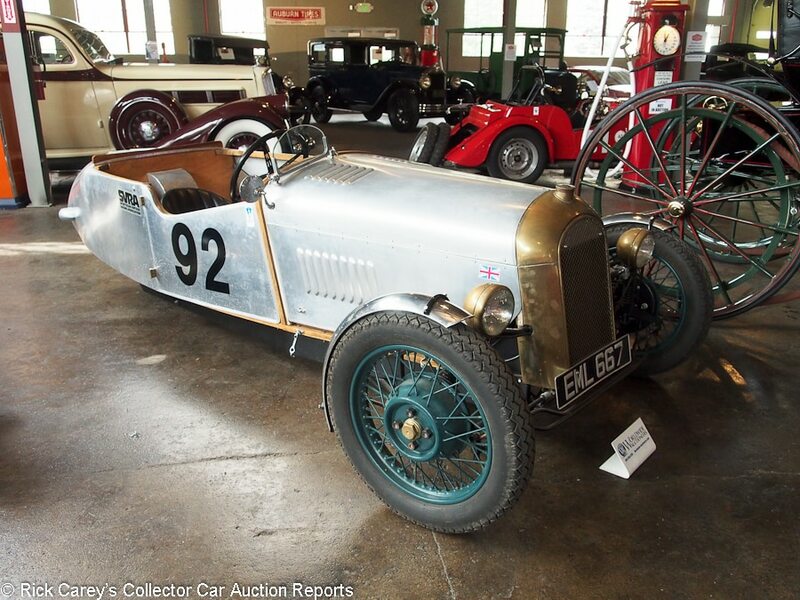 The MG NA Magnette, Morgans and Avanti were opportunities for informed collectors. The 1907 Stoddard-Dayton was marvelous, an antique of serious excellence in performance and presentation. The cars described are sorted by marque, model, body style and year. And, if you think it’s difficult photographing cars in most auction settings, trying to get a clear shot of the car without spectators and dealing with brilliant backlighting, try it in the Cord Front Drive Assembly Building with erratic overhead skylights…. 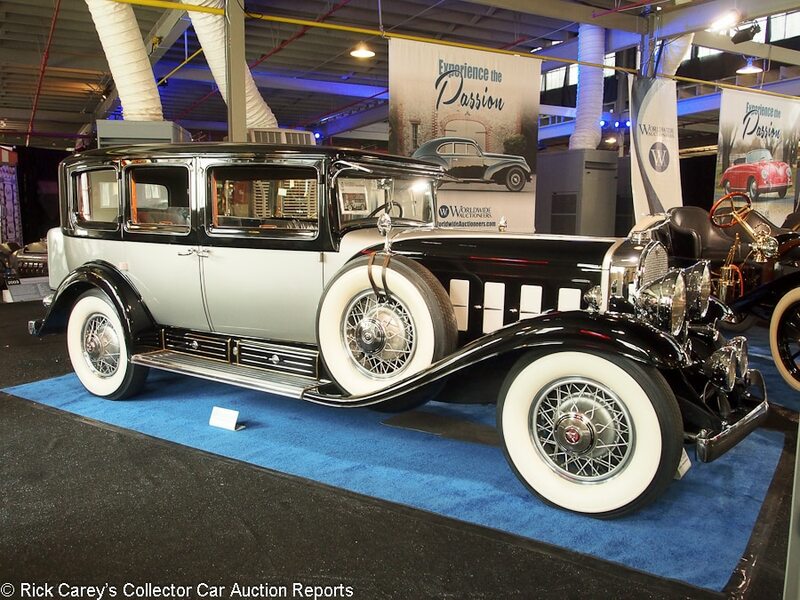 Lot # 54 1930 Cadillac 452 V-16 Imperial Limousine, Body by Fleetwood; S/N 700859; Silver, Black/Black leather, Grey cloth; Older restoration, 3 condition; Hammered Sold at $90,000 plus commission of 10.00%; Final Price $99,000. No Reserve. – Silver painted wire wheels, wide whitewall tires, dual sidemounts with mirrors, windshield visor, metal luggage trunk, Trippe lights, jump seats, footrests, rollup division, smoker’s kits. – Restored in the 80’s and showing its age with limited use. The paint is sound, if nicked and chipped from use. The interior is very good, particularly the woodwork. The driver’s seat covering is stretched. Chassis is road grimy and oily. The colors are dated, which mitigates the car’s usefulness as a tour car. Jimmie Taylor collection. – Offered at Auburn Fall in 2001 where it was reported bid to $72,100 while showing the same 67,852 miles on the odometer that it displays today. It was reportedly sold a month later to the previous owner who took home a Lion award with it at Meadow Brook in 2002. It is an imposing automobile on tours, but no longer appropriate to show in any demanding setting. 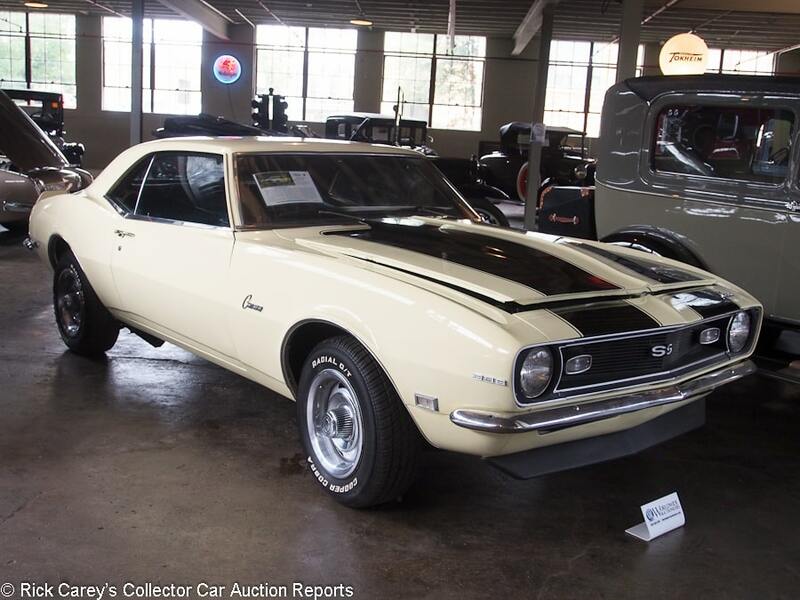 Lot # 12 1967 Chevrolet Camaro 2-Dr. Hardtop; S/N 123378N328859; Butternut Yellow, Black stripes/Black vinyl; Modified restoration, 3- condition; Hammered Sold at $17,500 plus commission of 10.00%; Final Price $19,250. No Reserve. – Replaced 396 or 402 engine (coded CLB), automatic, console mounted aftermarket engine gauges, Rally wheels, trim rings, Radial Cooper tires, SS trim added, Grant GT steering wheel, Kenwood CD – Sound paint, older interior. Dirty engine compartment, chassis and underbody. Foggy gauges. Not for the faint of heart. Chuck Runyon estate. 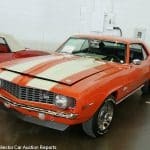 – This is a generally nasty Camaro of uncertain history or configuration and it is a gift to the seller that it brought this much. 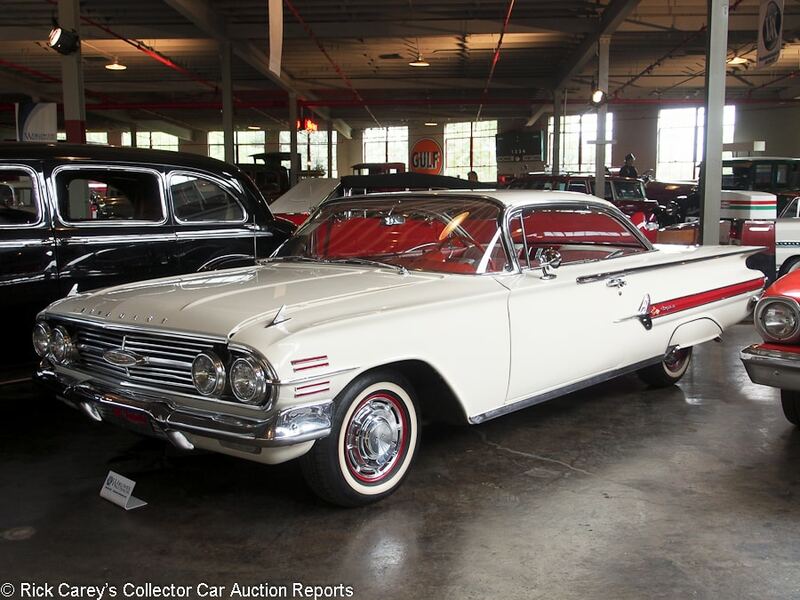 Lot # 39 1960 Chevrolet Impala 2-Dr. Hardtop; S/N 01837B114689; Engine # V07231CT; White/White vinyl, Red herringbone; Visually maintained, largely original, 3 condition; Hammered Sold at $25,000 plus commission of 10.00%; Final Price $27,500. No Reserve. – Later 327 engine, 4-barrel, Powerglide, pushbutton radio, wheel covers, narrow whitewalls, skirts, no power steering or power brakes. – Repainted over old paint and some chips with masking holidays. Weak bumper chrome but better trim chrome. Good interior and gauges. Orderly but aged engine compartment. Old undercoat in the wheelwells. Jimmie Taylor collection. – The “CT” engine block code doesn’t relate to any known 327, or to anything other than a 283/245hp dual quad block. This is an ordinary and not particularly appealing weekend driver and the seller should be grateful for getting this much for it. 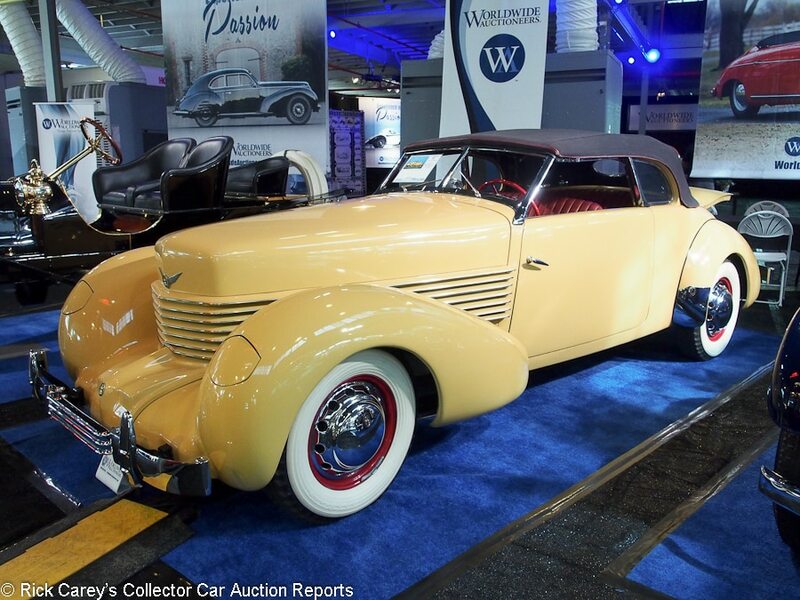 Lot # 67 1937 Cord 812 Phaeton; S/N 1827H; Engine # FB2447; Cigarette Cream/Red leather; Black cloth top; Older restoration, 3 condition; Hammered Sold at $87,500 plus commission of 10.00%; Final Price $96,250. With Reserve. – Wide whitewall tires, Red wheels, large hubcaps, radio. – Replacement lot for the cataloged 1932 Pierce-Arrow V12 Coupe s/n 350087. Sound old repaint, some weak chrome trim, good interior. Engine compartment and chassis are oil misted and road grimy. A touring quality older restoration. – This is a representative result for an 812 Phaeton in sound but aged and toured older restored condition. 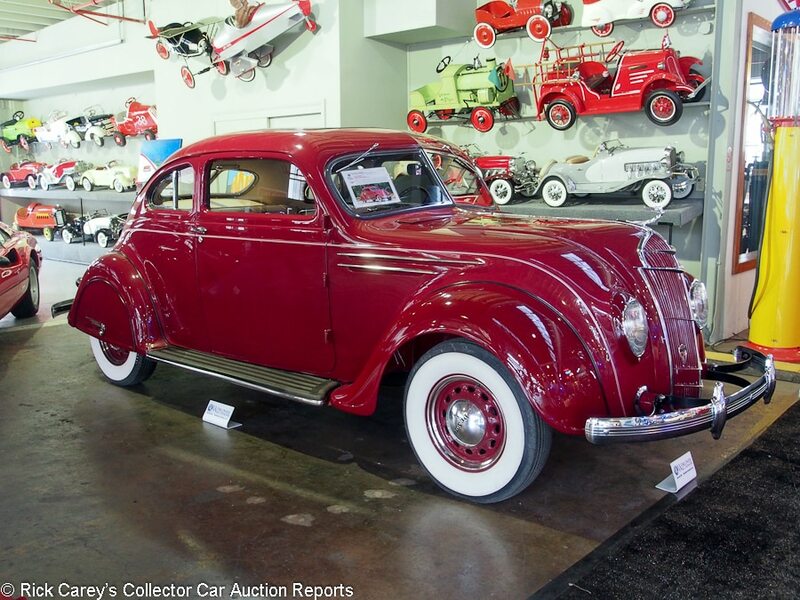 Lot # 46 1935 DeSoto SG Airflow Coupe; S/N SG5751; Envoy Red/Beige leather; Cosmetic restoration, 3+ condition; Hammered Sold at $55,000 plus commission of 10.00%; Final Price $60,500. No Reserve. 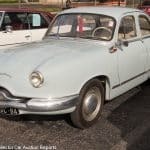 – Hubcaps, trim rings, wide whitewalls, skirts, chrome tubing seat frames. – Cosmetically restored with impressive paint let down by a big sag on the right front fender. The equally impressive new interior still smells like the upholstery shop. Bright chrome. The engine compartment, chassis and underbody are dusty and dirty. It is a quality restoration that didn’t pay much if any attention to what isn’t instantly visible. – A lot of money was spent on this Airflow’s cosmetics while the engine and chassis were ignored. In one respect that shows how good the car was when found on blocks where it had sat for 50 years, but otherwise it is a car that will always disappoint when the hood is raised. Neither does it give any confidence at all in how well it will drive or how reliable it will be. The price it brought reflects the visual impression it makes, but is generous for what the car is taken as a whole. 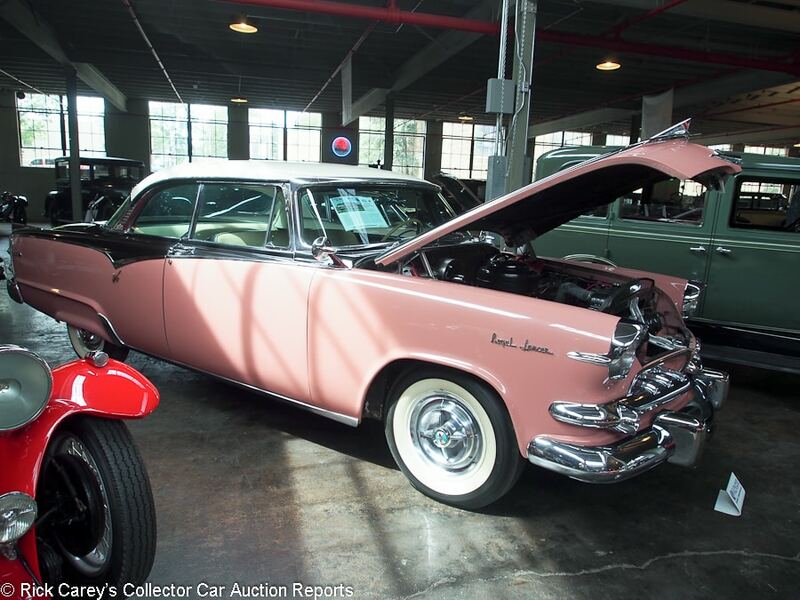 Lot # 49 1955 Dodge Custom Royal Lancer 2-Dr. Hardtop; S/N 34833524; Pink, Black, White roof/White vinyl, Black cloth; Visually maintained, largely original, 3- condition; Hammered Sold at $22,000 plus commission of 10.00%; Final Price $24,200. No Reserve. – 270/183hp 2-barrel Hemi, automatic, power steering, power brakes, wheel covers, whitewalls – 33,959 miles from new, AACA Jr. winner. The pink is repainted with some overspray. Black is cracking. Chrome is weak. Interior is good. Engine compartment is aged and dirty. A coat of aluminum paint on the engine helps, but not enough. Mostly original and impressively preserved, it’s gotten what it needed but has never been apart. 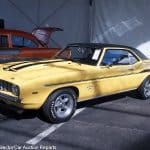 – This Dodge nearly qualifies as unrestored, it’s had so little work done to it, and the Auburn bidders paid a material premium for its originality, a price that is all that, and a little more than, the seller could reasonably have expected. Lot # 24 1979 Ferrari 308 GTS Spider, Body by Pininfarina; S/N 21083; Engine # F106AS30237; Red/Tan leather, Black accent stripes; Visually maintained, largely original, 3+ condition; Hammered Sold at $75,000 plus commission of 10.00%; Final Price $82,500. With Reserve. – Borletti air conditioning, power windows, alloy wheels, Michelin XWX tires, cassette stereo. – Titled on the engine number, F106AS30237. Engine cover support is missing. Good repaint with some erratic masking. Good interior, dash and gauges. Sharp engine compartment. Original underbody. An attractive 308 driver. 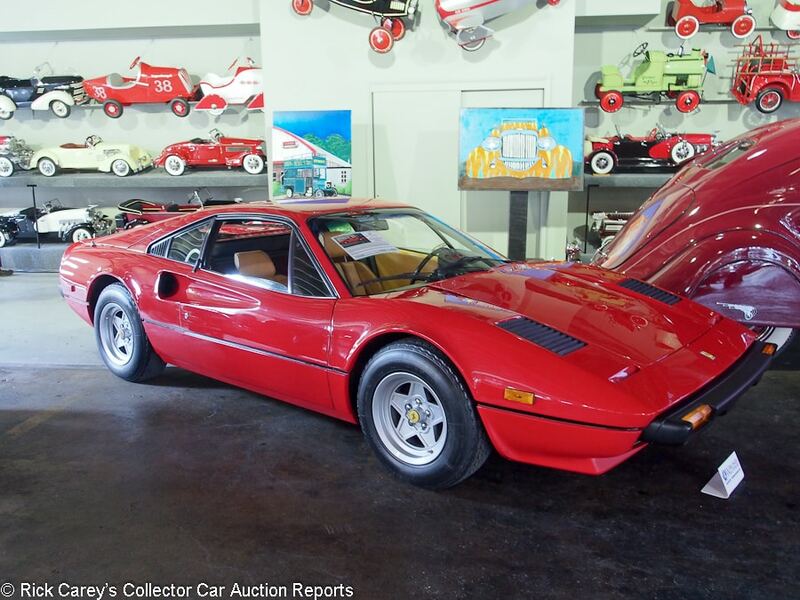 – Offered at Mecum’s KC sale in March where it was bid to $62,000, then at Branson a month later were it attracted only $50,000, neither of which did much to foretell the handsome result here. It is one of the last carbureted 308s and, aside from some masking issues in the repaint, in very good and well-preserved condition, considerations that make its price realistic, even if it’s not a great value. 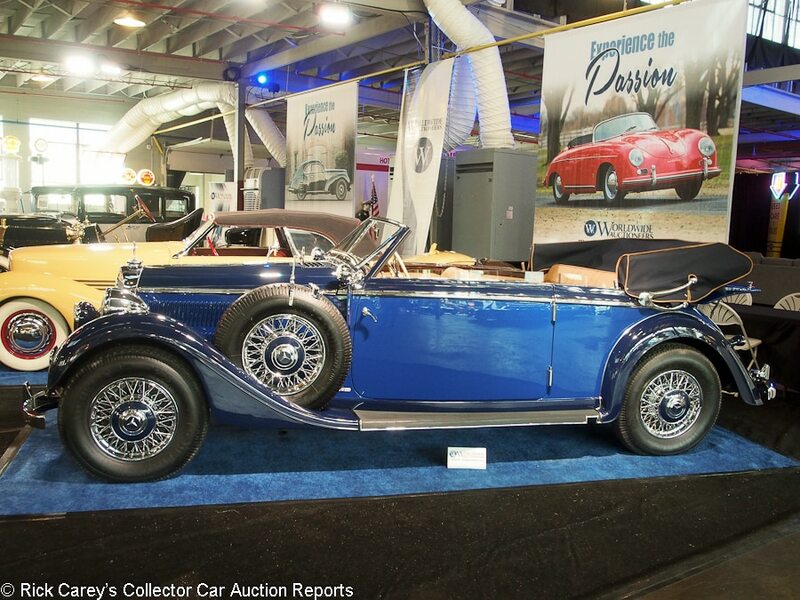 Lot # 55 1938 Mercedes-Benz 320 Cabriolet B; S/N 435053; Dark Blue, Bright Blue sides/Beige leather; Dark Blue cloth top; Concours restoration, 1 condition; Hammered Sold at $490,000 plus commission of 10.00%; Final Price $539,000. With Reserve. – Overdrive, chrome wire wheels, dual sidemounts with mirrors, blackwall Michelin tires, dual sidemounts with mirrors, dual spotlight/mirrors, Bosch headlight and single fog light, cowl mounted trafficators, opening vee windshield, fitted luggage, Bosch radio. – Show quality paint, chrome, upholstery and interior wood. Underbody, chassis and engine are like new. An impressive car, particularly for a 320. – Sold by Bonhams at the Grand Palais in Paris this February for $379,958 (Euros 356,500, today’s result is Euros 453,800), the bidders here in Auburn overlooked the fact that this is a side valve six-cylinder engine – even if it must be quite the best restored side-valve six-cylinder Mercedes-Benz Cab B in the world – and gave it closer to an 8-cylinder price. 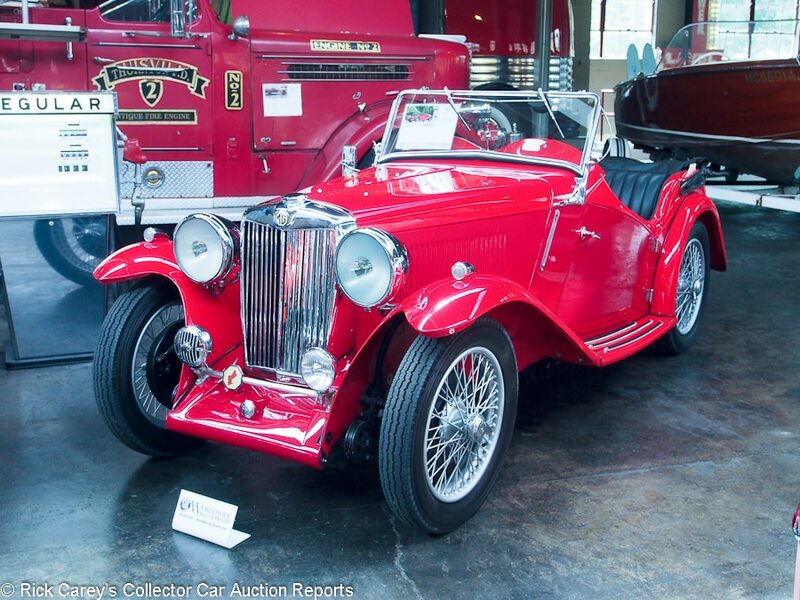 Lot # 82 1934 MG NA Touring; S/N NA0384; Red/Black leather; Black leatherette top; Cosmetic restoration, 3 condition; Hammered Sold at $40,000 plus commission of 10.00%; Final Price $44,000. No Reserve. – RHD. 1,271/56hp sohc inline six, 4-speed, silver painted wire wheels, Dunlop tires, rear mounted spare, banjo spoke steering wheel, Lucas headlights and single fog light, folding windshield, trafficators. – Added lot, not cataloged. Good recent repaint, chrome, interior and top done on an older restored engine and chassis. Doors have edge chips where they close. Tarnished instrument bezels. A presentable driver quality early MG. – But an unusual example of the single overhead camshaft six rarely seen in the States and thus something of a value for collectors who want to stand out from the crowd. Its condition is reassuring, at least to the extent the prior owner didn’t feel it necessary to redo the mechanicals before attending to the cosmetics. It was sold by Auctions America in Ft. Lauderdale two years ago for $45,100, close enough to the result here that it counts as the same and an endorsement of two things, a consistent value judgment and a static market in prewar MG Magnettes. 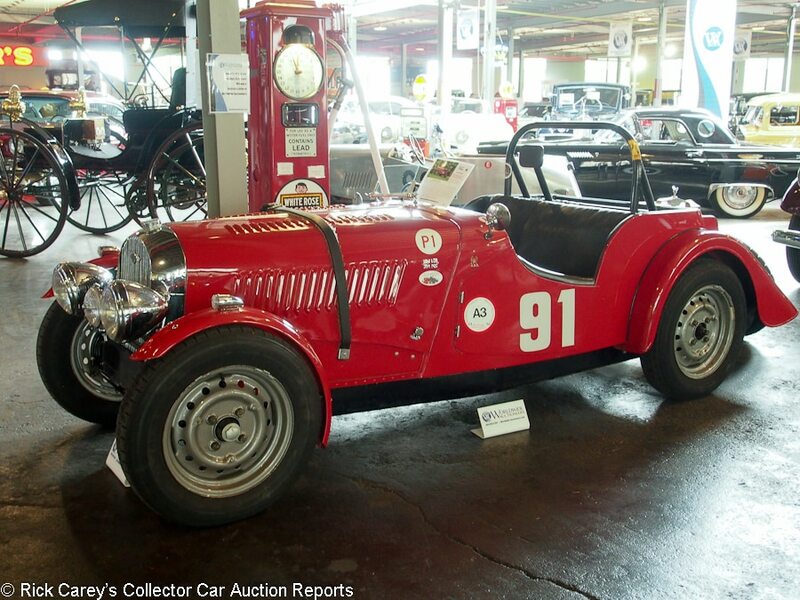 Lot # 64 1950 Morgan 4/4 Roadster; S/N MORQ59650; Red/Black; Competition restoration, 3 condition; Hammered Sold at $20,500 plus commission of 10.00%; Final Price $22,550. No Reserve. – RHD. 1267/40hp Standard engine, ohv head, headers, dual SU carbs, steel wheels, Michelin tires, single aeroscreen, braced full width rollbar, cycle front fenders, turn signals, dual rear spares, Lucas headlights and single fog light, modern VDO tach. – SVRA race prepared with decent cosmetics and attention to detail and safety. Not raced since 2010 and therefore probably in need of substantial re-commissioning before it can take to the track again. Allen Smith collection. – A sound and pleasingly presented flat radiator Morgan that, even in need of freshening and service, is a sound value at this price. Lot # 15 1936 Morgan F4 Roadster; S/N F372; Aluminum/Black vinyl; No top; Competition restoration, 3 condition; Hammered Sold at $13,000 plus commission of 10.00%; Final Price $14,300. No Reserve. – RHD. Brass radiator and headlight shells, unfinished aluminum body, single aeroscreen, modern Smiths gauges and electronic tach, alternator, hydraulic brakes, chrome cycle style front fenders, dual SU carbs. – Body panels and wood framing have been remade. Engine and chassis restoration are older. Set up for SVRA racing but stored in recent years and in need of fettling. Allen Smith collection. – A good enough example that will hold its own on the race track and not be out of place at a British car or Morgan meet at an entirely reasonable price. It needs a winter’s work to make sure it’s ready and safe, but that is reflected in the price. 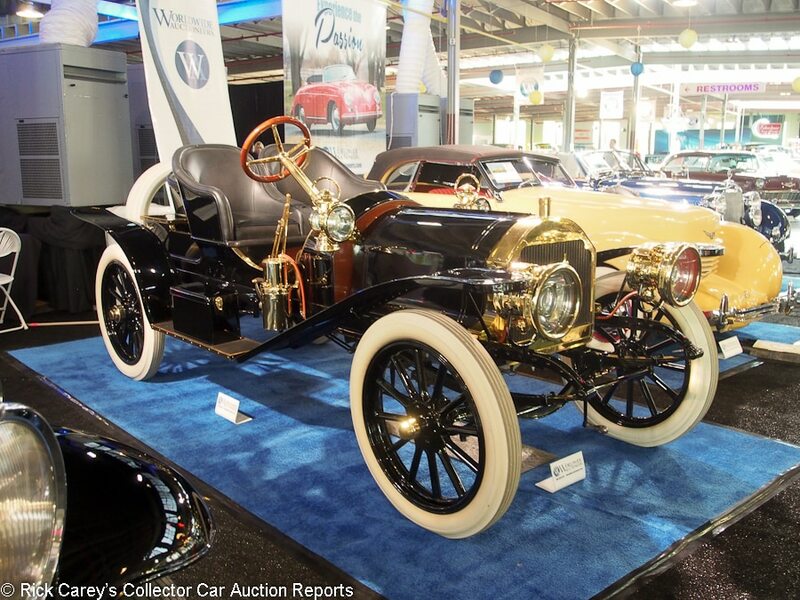 Lot # 34 1907 Stoddard-Dayton Model K Runabout; S/N F1505; Engine # 1004K; Black/Black leather; Concours restoration, 1 condition; Hammered Sold at $108,000 plus commission of 10.00%; Final Price $118,800. With Reserve. – RHD. T-head dual ignition four, Solar acetylene headlights and acetylene generator, Solar kerosene sidelights, single rear seat, no windshield, white tires, dual rear spares. – Fully restored with excellent paint, upholstery and brass. Engine compartment and chassis are done like new and everything is clean and tidy. Built up from a chassis and bits, then mechanically thoroughly redone by Mike Grunewald in 2015. Demonstrated at the 2016 Indy 500 and said to run and drive well. – It is unlikely that this Stoddard-Dayton started life as a Runabout, but that is hardly relevant to its value today. 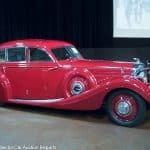 The restoration is still concours-quality and its recent mechanical work make it an exceptional and unusual mount for all sorts of antique events where its 354 cubic inch four will chug along at modern traffic speeds. It is worth whatever the Auburn bidders say it’s worth. 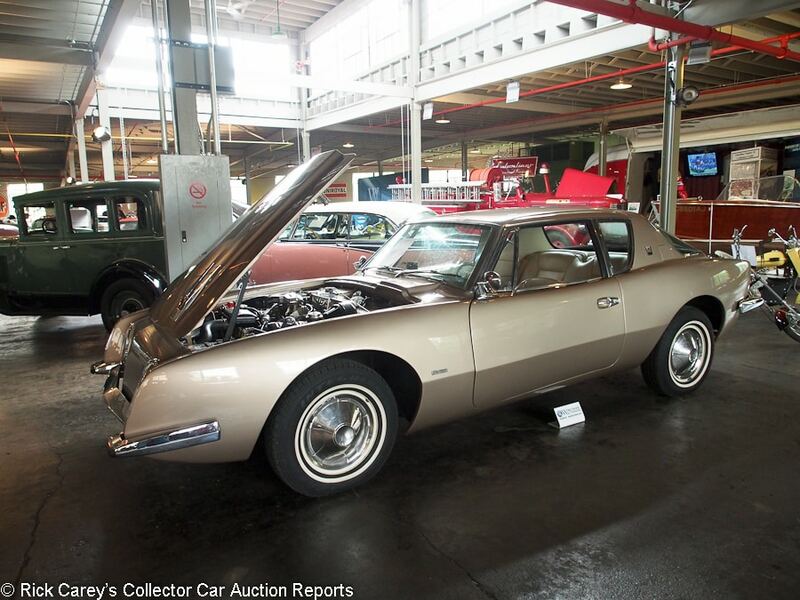 Lot # 42 1963 Studebaker Avanti R-2 Coupe; S/N 63R2075; Gold/Beige vinyl; Older restoration, 3+ condition; Hammered Sold at $42,000 plus commission of 10.00%; Final Price $46,200. No Reserve. – 289/289hp R2 engine, 4-speed, power brakes, wheel covers, narrow whitewalls. – Sound paint and interior. Some small masking holidays, orderly but aged engine compartment, dirty chassis and underbody. A good older restoration in attractive driver condition. – Either the Avanti story from Mecum Monterey hadn’t reached Auburn, or the assembled multitudes were still too shell-shocked to follow Monterey’s lead. Out there two R-2 Avantis sold for $126,500 and $99,000. The price here in Auburn is historically accurate for a good 4-speed R-2. This one sold at Barrett-Jackson Scottsdale in 2005 for $22,950. It will be interesting to see what happens the next time it crosses an auction block.